Design thinking is one of those words that seem to split the world into either radical fans or unwavering opponents who tend to ridicule it. In my practice of a designer, I experimented with all sorts of activities related to design thinking. It had nothing to do with product design, but included matters as visualizing roadmaps, creating narratives for new products, facilitating workshops and so on. I learned the hard way that my views often diametrically opposed views of others. Who and why was ‘right’ is not of relevance here. I discovered that we had different paradigms on innovation, and as result we hardly understood each other. This might explain why design thinking is not well accepted in the worlds of business or science: it often perceived as being naive. It seems to forget or even reject quantitative data; it hardly discusses the bottom line. Rather, design thinkers put forward perspectives of a future that provides a sense of lightness and delightful promise. Below I will discuss 4 colliding paradigms, among others design thinking. (1) The beliefs of people whether or not the world around us can be analyzed and/or predicted. At one hand, some believe that what happens in the world can be measured and analyzed well, and predictions can be made about the future. In order to provide business cases for new innovation projects, predictions about e.g. market share must be made. At the other hand, some believe that the world as it unfolds, hardly can be analyzed. Let alone predicted. As such, any attempts to measure and predict e.g. what customers want, should be looked at with suspicion. (2) The belief to what extent organization can intervene in the course of events. At one hand, some believe that the world unfolds the same way regardless what they do. We are passive onlookers to the grand scheme of things. For innovation this can be translated into: needs always remain the same, innovations merely fill in latent needs. At the other hand, some believe they can actively intervene and orchestrate what happens. Needs are a result of what is available. Products and services that are developed will change the market, and how people will look at similar products and services. Combined into a simple 2×2 taxonomy, 4 paradigms of thinking can be discerned of people that fundamentally interpret the world differently, and act accordingly. They are depicted below, including some examples where these paradigms easily can be found. This view assumes everything can be measured and predicted, and as a result innovation makes sense as long as it meets the requirements put forward by the rigorous – read quantitative – analysis. If it can’t be measured, it is nonsense. What smart phones need to deliver in 3 years from now can be extrapolated on the base of market research conducted today. I encountered this paradigm in the domain of business analysts that know the market through and through, yet stick to extrapolating numbers. However, the analytic paradigm also assumes that it is not possible to upset the scheme of things. Needs won’t change as an effect of e.g. an introduction of a product or service. That an iPhone profoundly changed the smartphone market was maybe unexpected, but a real good analyst would have predicted it. Scientific rigor and statistics dominate to predict e.g. market share. However, there is a fallacy: it more or less neglects other aspects of innovation. After rigorous analysis and defining what is needed, the remaining part is merely ‘execution’ that can be outsourced. With a well defined set of requirements, you can order a high speed train anywhere, right? This view assumes that the world develops in unpredictable ways and cannot be influenced. Customers all of a sudden liked the iPhone, but you could not possibly see it coming. It happened. It is an opportunistic paradigm: as the world is unpredictable, all sorts of possibilities keep coming. It is a matter of pinpointing these before others do. If you see a chance, take it! This paradigm relies on networks, on casual personal contacts, e.g. with opinion leaders. Be on the lookout for quick wins, e.g. by reselling products cheaper through different channels; or outsmart others by small but decisive adjustments in products. This paradigm is at unease with long term innovation: why invest in the development of any new technology, products and services if the world can and will change, often disruptively? I came in contact with this responsive and opportunistic paradigm in the domain of sales, and small or medium sized organizations. This view believes that the world is predictable and companies can change the course of events they are part of. Market intelligence, combined with smart technology development pave the way for new products and service that decisively will alter the face of the market. Think, and think well before you leap! The drawback is the time needed, and the inclination to stick to predefined processes, come hell or high water. It combines the rigorous analysis of the outside world (where do we stand) with assessing technology (what do we have). This paradigm aims to balance technology and market needs. But it is also an openly rationalistic perspective: ‘intuitive beliefs’ and ‘opportunistic ideas’ are nonsense. 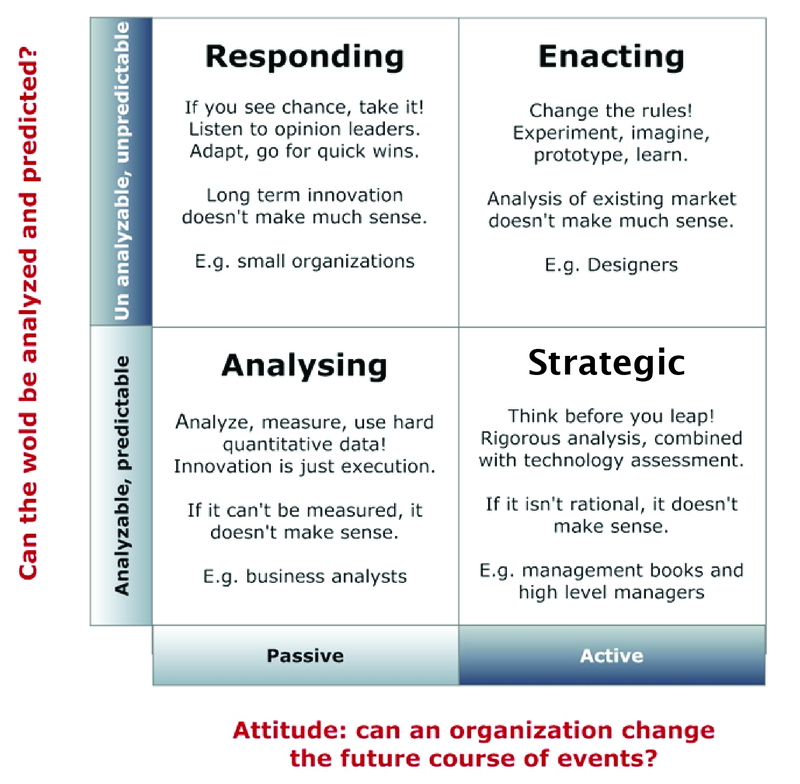 This strategic paradigm can best be recognized in most management books on innovations, and I encountered it whilst collaborating with senior management. Every now and then I felt it is a kind of utopia, as seldom time and resources seem to be adequate to meet the rigor that is needed. This view believes that the introduction of new product / services radically can change the marketplace, and the world we live in. However, you won’t know until it happened. Market analysis, customer insights, business intelligence: good to know but it has hardly any predictive power. So maybe better skip it altogether, better to trust your own observations and intuition. The basic idea is to have an idea, prototype it, test it, put it to market an see what happens. It is all about experimentation: learning by doing. Daft and Weick mentioned this paradigm is about leaving paved ways, ignoring rules, thinking outside the box. Basically because it is believed this is the only way to succeed: change the rules! 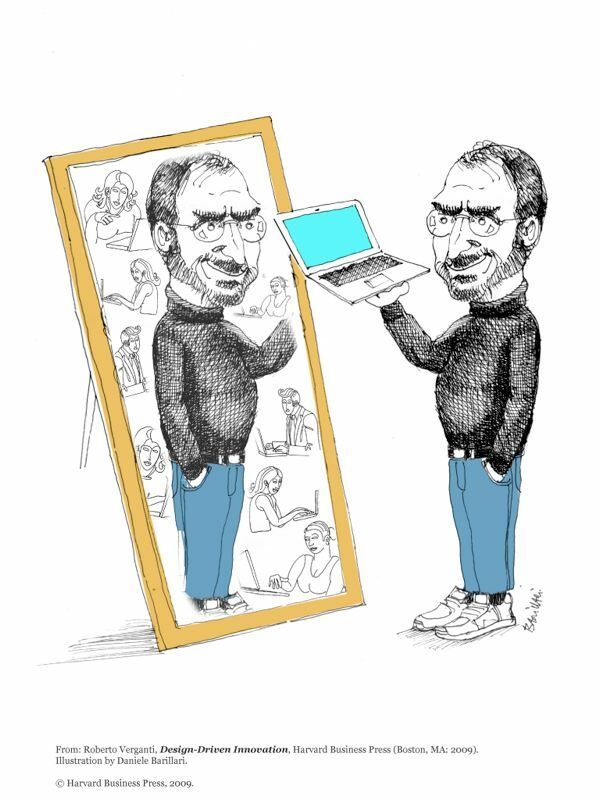 Verganti in his book on design driven innovation has a cartoon depicting Steve Jobs in front of the mirror, asking himself what he would want. Market research Apple style. This paradigm easily can be recognized in the realm of designers and design thinkers. People with different paradigms look at the same world, but literally ‘see’ things differently. As a result the interactions become troublesome. Lets imagine that 4 persons with different paradigms need to collaborate on a difficult problem. Something like: what should company X do now they missed the market of large smartphones? All 4 may prepare well and with no cost restrictions. One day they meet, now what do they suggest to each other? The analyst will present his findings of 1276 interviews conducted in 23 countries. He will have an impressive analysis with data, statistics, charts and graphs. He will explain in detail what company X has to deliver in 2 years from now if they want to succeed: a large best in lass smartphone. The others may feel somewhat uneasy, because he refrains from telling how. For him that is a matter of execution.The responding opportunist will tell about his insightful trips and meetings with all sorts of interesting opinion leaders. He will explain how company X should jump into the emerging market of developing countries, as the existing products perfectly fit the specific situation there. No need to innovate. The strategist, likewise the analyst, will provide ample quantitative data on what can be expected in the market coming years. But contrary to the analyst, the strategist also assessed the existing products and compared it to other products, by means of rigorous testing. He will not only explain in detail what is required within few years, but also that it is best to invest into 4G technology. Eyebrows are raised when the strategist claims he needs only few years to get there. The enacting design thinker will tell of his observations and talks with of (lead-) users and how he came to think that the ‘phone’ component of smart phones is actually unimportant. Smart phones are lifelines to social communities at any given time and place. He devised some prototypes for new apps and services, that revolve around these communities. The prototypes were given to a bunch of teenagers who refused to return it. He believes that the smartphone itself need to be adapted as well, fitting into the ‘social grid’. The point I like to make is not what paradigm is best. Actually: I believe we need all four. The point is: just imagine how the other three reacted on the ideas of the design thinker. “So you followed a hunch?” “In how many countries did you test your app, one?” “How does your business case look like, if you have any?” Despite the fact he may have great and promising ideas, he lacks hard data. Of course: because he does not believe it can be predicted a priori. Yet that omission makes his story ridiculous in the eyes of those who rely on meticulous analysis.Likewise, despite the promising ideas, he lacked a well defined process so he is a ‘lucky amateur’ at best. Yet, what I learned in last years that design thinkers may look naive and amateurish, but surely provide the frames and ideas that enable others to progress! Great thinking and writing Guido! Thank you! The way I’ve always interpreted and practiced design thinking is however contrary to the way you frame it here, and maybe contrary to the way it’s being popularized right now through the writings of Tim Brown et al. And I’m sure you will partly agree with me when I say that I don’t see design thinking as only out of the box, right brain, intuitive, diverging brainstorming. As a matter of fact, for me one of the crucial powers of design thinking is that it COMBINES analysis with synthesis, outside the box with inside the box, diverging with converging, user centered approaches with business centered approaches, intuitio with ratio. Isn’t that what was originally so fascinating about design thinking (next of course to the notion of dealing with complex/wicked/ill defined problems through the co-evolution of problem and solution through reframing, iteration and prototyping) ? Isn’t that what we’re trying to teach our students and demonstrate to our clients and bosses? If design thinking is only one side of the coin, only out of the box, only the user’s perspective, only following hunches without the ability to base them on rigorous business analysis, I for one will gladly step away from it and never use the term again. Am I naive in hoping that the design thinking community has more to offer? Has the post-it generation really taken over? I understand your comment. I have to admit that the blog is rather black or white for the sake of argument, missing grey shades. Nevertheless, last year I came to believe that WITHIN TEAMS composed of all sorts of people with distinctive backgrounds and the like, design thinkers (as I describe them here) are not only somewhat missing compared to the numerous analytic styles people, but also above all should do what they ar good at. The creative, user r centered, post-it kind of activities. Because that what is needed inside the teams that love to analyse and have formal specifications. Does that mean the Design thinker is not business oriented? Not at all, he just takes another – very business oriented perspective!